Palestinians in the West Bank were finally allowed high-speed 3G mobile data services at the beginning of this year. In world where fourth generation of mobile technology is available in even the most remote areas – from the peak of Mount Everest to the islands of the South China Sea – Israeli restrictions have until now forced Palestinians to settle for outdated second-generation technology. And their economy reflects it. 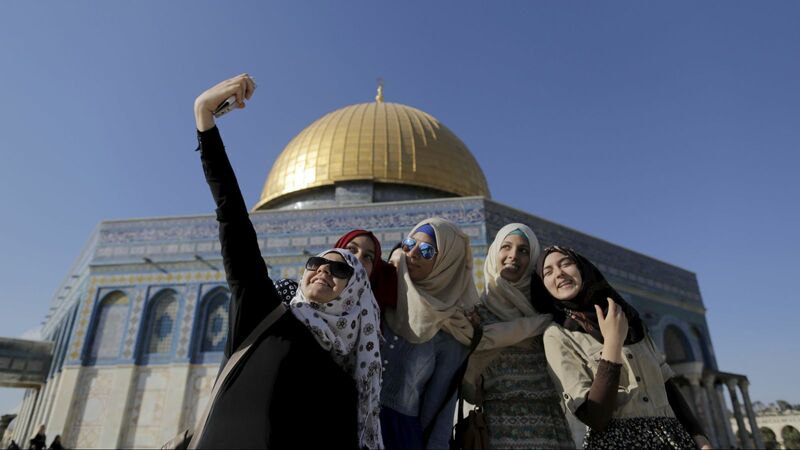 The only two Palestinian cellular providers Jawwal (owned by Palestine Telecommunications/PalTel) and Wataniya Mobile (a subsidiary of Ooredoo) launched 3G mobile networks for customers in the Israeli-occupied territory at end of January 2018. Both these operators have to license their wireless spectrum from the Israeli government and route their traffic through Israel. And while Israel’s government granted 4G licenses to six Israeli mobile operators in 2015, Palestinians have remained stuck two generations behind. 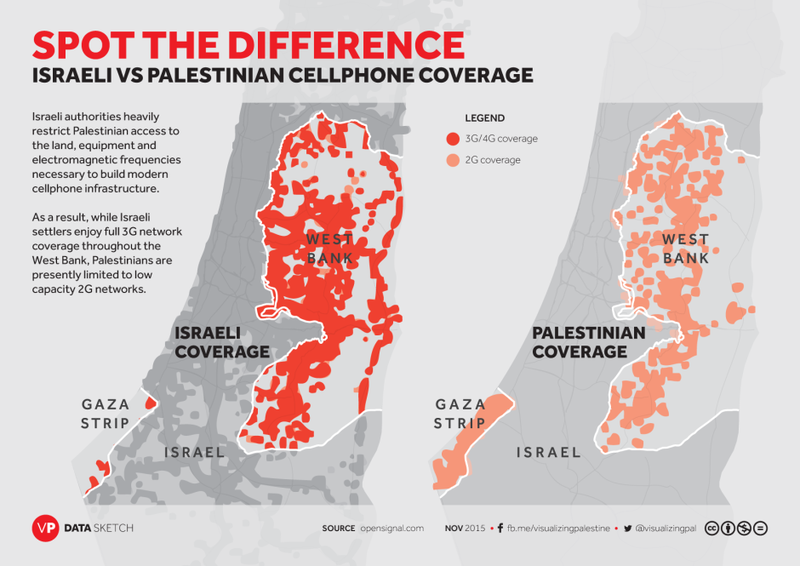 Israel, where 3G networks went into service in 2004, had previously blocked Palestinian mobile companies' access to the necessary frequencies for nearly 12 years. In November 2015, it agreed to allow 3G in the West Bank alone and not in Gaza, however this was further delayed for unknown reasons. Israel’s reasons for keeping Palestine on 2G up to now are not entirely known, however it is speculated that less-secure 2G networks are easier for the Israeli authorities to monitor—or at least to monitor without detection. They can eavesdrop (or potentially mass send everyone their own text messages, as evidenced in the Israeli assault of 2014) on traffic coming over Israeli companies' networks. But there could also be commercial reasons for delaying 3G. Palestinians often opine that one less visible economic aspect of Israeli occupation means that the 4 million strong Palestinian population living under Israeli control in the West Bank and Gaza is often used as a lucrative market for Israeli goods and services, to the detriment of Palestine’s own economy. One feature of Israel’s control is its stranglehold on the mobile market. According to Ammar Al Aker, Palestine Telecommunication’s Chief Executive Officer (CEO), the number of Israeli SIM cards (which are deemed illegal to sell or purchase in the West Bank and Gaza) have recently spiked. Al Aker said that before 2015, the number of Israeli SIM cards in the West Bank was estimated at 150,000, but in 2015 the number rose to 370,000 cards.Israeli SIM cards allow the residents of the West Bank to enjoy 3G coverage, whereas the Palestinian operators were restricted to 2G and effectively forced out of the market. Israel also keeps Jawwal and Wataniya in a chokehold in another way, by licensing far less spectrum to them than to Israeli firms. In the 2015 4G auction, Israeli companies bid on a total of 65 MHz of spectrum (on top of what they already had in 3G), to serve Israel’s population of 8 million people. Jawwal and Wataniya together have less than 10MHz, for a population slightly more than half that of Israel’s. Tight spectrum means slower connection speeds and more dropped calls. It’s no surprise, therefore, that by one estimate, Israeli operators have 20%-40% of the Palestinian market, costing the Palestinian providers $80 million to $100 million a year in potential business. The World Bank, in a 2016 report, estimated that Palestinian cellular companies lost between $436 million (£308 million) and $1.5 billion in potential revenue in 2013 to 2015 due to Israeli restrictions on frequencies and equipment imports, and unauthorized competition by Israeli operators. And so there may well have been some pressure on the government to let the Israeli companies—which are also in such fierce competition with each other that not all of them are expected to survive—maintain their edge. Jawwal is owned by the local Paltel Group and the leading provider in the Palestine Territories including Gaza with more than 2.5 million customers and a market share of more than 80%. In 1999, Israel licensed access to 4.8 MHz in the 900 MHz band to Jawwal, they still retain the same access, but for more than 2.5 million subscribers compared to only 120,000 in 1999. Five gigabytes of data from Jawwal costs about $30, compared to $5 in Jordan and less than $4 in Israel. Many Palestinians will still use illegal Israeli 3G services because of the cheaper prices. However despite its elevated cost, Ammar Al Aker still believes that the 3G service will help “improve Palestinian citizens’ lives and develop the economy.” To this end, he confirmed that the Jawwal network is “powerful and widespread” and that in order to serve the largest number of users the company has installed 1,000 cellular towers in the West Bank. Wataniya Mobile of the Kuwait-based and Qatar-owned Ooredoo Group. It started as the second mobile operator in 2009 in the West Bank. In 2017 it extended its area of operation to the Gaza Strip. Wataniya is now at the break-even point, but that it once suffered losses of as much as $20 million a year, it has only stayed afloat due to its main investors Ooredoo and the self-rule governments Palestinian Investment Fund. The economy of the West Bank should significantly benefit from the new 3G services. Smaller Palestinian entrepreneurs also expect an immediate 3G bump in business. Alaa Amouri, 20, a student, said she gets 4G from an Israeli provider that offers only partial coverage in the West Bank. Mobile data from a Palestinian provider would offer real-time updates on potential trouble on the roads, said Amouri, who commutes between east Jerusalem and her West Bank university, passing through the crowded Israeli-run Qalandiya crossing almost daily. It (3G) helps in getting news updates, she said. Sometimes when we are at the Qalandiya crossing, we find it blocked without knowing why. However due to continuing security concerns, neither Palestinian operator is permitted by the Israeli government to extend their 3G coverage to the Gaza Strip. Considering the continued blockade it is unlikely this will change any time soon. Similarly 4G technology will probably not be deployed in Palestine until the rest of the world as moved onto 5G. As mentioned in this report Palestinians could consider initiatives at the local level without waiting for external actors. More specifically, each Palestinian municipality could make sure that areas under its control are well connected by ensuring the installation of fiber backbone and microwave links. Municipalities can also add solar power panels onto their street lighting poles as well as a wireless network to ensure citywide Wi-Fi. In addition, mesh wireless networks, which are not dependent on centrally-located towers and can bypass obstacles like hills, are a promising new avenue for municipalities. Indeed, local companies proposed a study for Ramallah modeled on Brazilian and US cities using street lighting poles but were not able to secure the funding. Such local-level projects should ideally be undertaken within a clear overall vision and strategy. This is a complicated part of the world, ultimately political solutions are needed. However the status quo of technologically disadvantaging, and economically hindering Palestine is just another obstacle to peace.